You've found the “U.S. Poland China Pig Breeders” page here at Hobby Farm Wisdom! If this is the first time you have visited our site: Welcome! Poland China is the oldest American breed of pig, developed by crossing multiple breeds including Hampshire and Berkshire in 1816. Poland China pigs are typically black with six white patches on its body, specifically face, feat and switch. They cannot have more than one solid black leg to be registered as a Poland China. 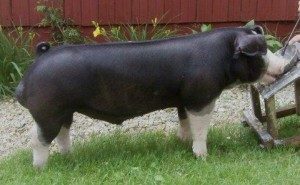 The Poland China pig is similar in appearance to a Berkshire pig with the distinct different of having droopy ears. They are superior feeders and gain extensively under proper care and management. Considered one of the largest breeds of pig, this breed is the highest U.S. pork producer in pounds of pig per sow per year. The largest pig every recorded was a Poland China named Big Bill, who measured 2,552 pounds.